Rhinos have existed for over 50 million years. In the past, at one time there were 30 species of rhinos, including the largest land mammal that ever lived. 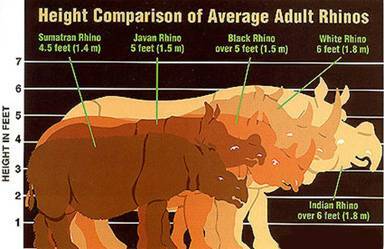 Rhinos were also common in North America. Rhinos belong to the same group of animals as horses; both are "odd-toed ungulates", or Perissodactyla. 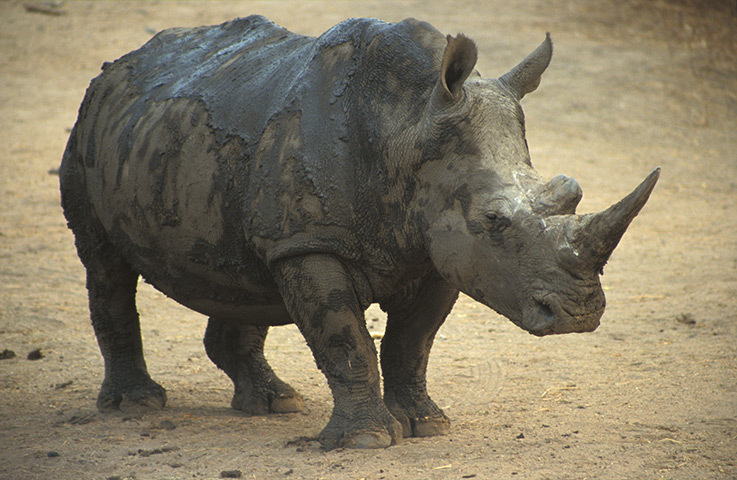 Rhinos have three toes, which leave distinctive tracks. They have thick skin which forms inflexible plates over the shoulders, haunches, sides, forehead and cheeks. 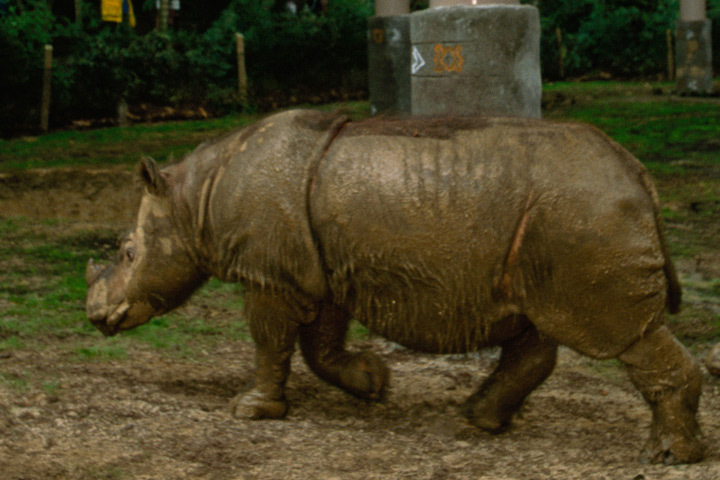 Rhinos are surprisingly agile, despite their bulky appearance. They have poor eyesight, but exceptional hearing and an acute sense of smell. Today, only five species of rhino survive. These five species are further divided into 11 identified subspecies. All rhinos are under threat of, and all but one species is on the verge of, extinction. Without drastic action, some rhinos could be extinct in the wild within the next 10-20 years. Only about 25,000 of these marvelous creatures survive in the wild with another 1,250 in captivity. 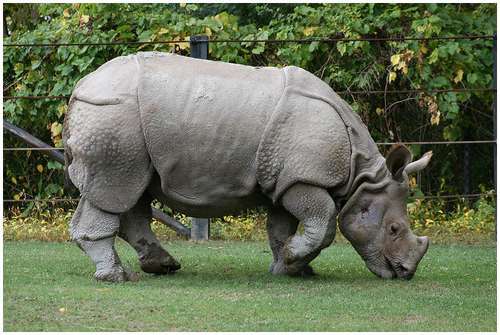 Of these rhinos, more than two thirds are white rhinos. There are only around 7,300 of the other four species combined. The Western Black Rhino of Africa was declared officially extinct November 10,2011 by The International Union for Conservation of Nature. The black rhino has suffered the most spectacular rate of decline of all rhino species in the last 10 to 15 years with populations reduced 85%. The rhino is being exterminated by poachers who sell the horn for medicinal or ornamental purposes in Asia and the Middle East. In Yemen rhino horn is carved into traditional dagger handles, which is worn by men as a sign of wealth. Without drastic action, four species of rhino could be extinct in the wild within the next 10 years. Of these rhinos, over half are of a single species - the white rhino. No more than 44 individuals – believed to be stable Rarest of all rhinos, the Javan rhino survives only in Indonesia’s Ujung Kulon National Park. Sadly, this year, we believe that the last Javan rhino was poached in Vietnam’s Cat Loc Reserve. In Ujung Kulon, best survey estimates, backed up with camera-trap data, suggest that no more than 44 animals remain in the park. Of these, we suspect that there are only four or five females with breeding potential. The highest priority actions for Javan rhinos are continued protection of the existing population and collaborative efforts to expand useable habitat in Ujung Kulon as a precursor to establishing a second, ‘insurance’ population elsewhere in Indonesia. Fewer than 200 individuals – decreasing Only about 200 Sumatran rhinos survive in fragmented populations on the islands of Sumatra and Borneo. In Sumatra, Indonesia, between 130 and 175 rhinos are scattered among three populations in Bukit Barisan Selatan, Way Kambas, and Gunung Leuser National Parks. In Sabah, Borneo, Malaysia, approximately 20 Sumatran rhinos remain in fragmented populations; no evidence of rhinos has been seen in peninsular Malaysia for several years. The primary threats facing this species are human encroachment into the rhinos’ habitats and poaching. The future of Sumatran rhinos depends on continued protection by highly trained anti-poaching teams, intensive management within protected areas, and creating incentives for local communities to decrease encroachment. At least 2,850 individuals – increasing The greater one-horned rhino population now numbers around 2,850 and is slowly growing. In 2010, poaching pressure on the species in India and Nepal slightly decreased. Greater one-horned rhino numbers are increasing mostly because of the growing population in Kaziranga National Park, which now numbers more than 2,000 animals. To continue this growth, however, protection measures must endure and efforts to spread the population out among different protected areas over the next few years must continue. At least 4,860 individuals – slowly increasing Black rhino populations were brutally hit by well-organized and highly-armed gangs of poachers in 2010, particularly in South Africa. In Zimbabwe, where we moved animals to safer areas, poaching decreased significantly this year. Black rhino strongholds include South Africa, Namibia, Kenya and Zimbabwe, in descending order. Highest priorities include continuing to protect existing populations from organized criminal poaching gangs and ensuring effective prosecution of wildlife crime. At least 20,150 individuals - increasing White rhino populations continue to grow despite the heaviest poaching pressure faced by the species in 16 years. South Africa alone lost 333 rhinos to poaching syndicates this year. More than 40 percent of these were lost in Kruger National Park, which borders Mozambique. Private sector game ranches are also under siege. Despite poaching pressure, the southern white rhino is still increasing and is considered ‘Near Threatened’ by the IUCN. A group of rhinos is called a “crash”. White rhinos aren’t white. (And black rhinos aren’t black.) The white rhino’s name is taken from the Afrikaans word describing its mouth: “weit”, meaning "wide". Early English settlers in South Africa misinterpreted the "weit" for "white". Rhinos are fast! They can run up to 30 – 40 miles per hour, which may not sound like much, but if one is running straight towards you it feels like a NASCAR race car is coming your way. Rhino pregnancies last 15 – 16 months. Yikes! Contrary to the common myth, there is no evidence that rhinos stamp out forest fires! The white rhino is the largest rhino (and the largest land mammal after the elephant) – they can weigh up to 6,000 pounds. 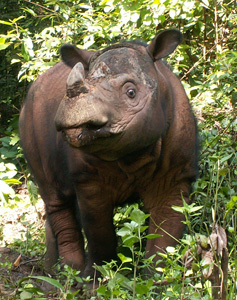 The Sumatran rhino is the smallest rhino, weighing in at a mere 1,300 – 2,000 pounds. 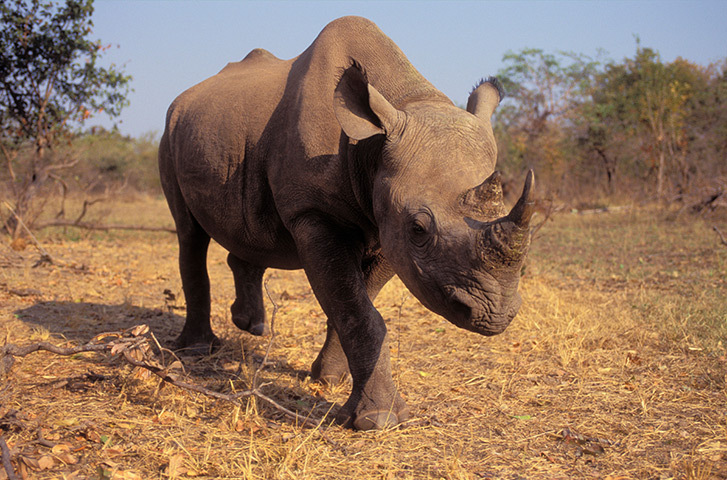 African rhinos have a symbiotic relationship with oxpeckers, also called “tick birds”. In Swahili, the oxpecker is called “askari wa kifaru”, which means “the rhino’s guard”. The oxpecker eats ticks and other insects it finds on the rhino, and creates a commotion when it senses danger. Rhinos have existed on earth for more than 50 million years, and once roamed throughout North America and Europe (as well as Asia and Africa). Throughout their history, rhinos have been a very diverse group. The extinct rhino Paraceratherium was the largest land mammal that ever lived, and resembled a big, muscular giraffe. Telecoeras was a single-horned, hippo-like grazer common in North America. The book, The Wonderful Wizard of Oz, written by L. Frank Baum and illustrated by W.W. Denslow, differs a lot from the movie classic, and actually has a reference to rhinos. Dorothy, the Scarecrow, the Tin Man and the Lion each get to meet the Wizard individually and he appears differently to each one of them. To Dorothy he appears as a huge head, to the Scarecrow as a beautiful woman, to the Lion as a great ball of fire, and to the Tin Man as a terrible beast. The beast is described as such, "It was nearly as big as an elephant, and the green throne seemed hardly strong enough to hold its weight. The Beast had a head like that of a rhinoceros, only there were five eyes in its face. There were five long arms growing out of its body and it also had five long, slim legs. Thick woolly hair covered every part of it, and a more dreadful-looking monster could not be imagined." Somehow, this never made it to the film version. Three of the five surviving rhino species (black, Javan and Sumatran) are Critically Endangered, which means there is at least a 50% chance that these species will become extinct within three generations (for rhinos, this means about 30-60 years). Not all rhinos are solitary – both black and white rhinos commonly live in extended family groups (particularly females and calves). Rhino horn is not used as an aphrodisiac in traditional Asian medicine. It is actually used to reduce pain and fever, although there is no scientific evidence to support this usage, and of course, it is illegal. The most famous piece of rhino artwork is Albrecht Durer’s woodcut, “The Rhinoceros”, printed in 1515. It (not entirely accurately) depicts a greater one-horned rhino sent as a gift from the King of Portugal to Pope Leo X, and has been reprinted countless times over the past 500 years. 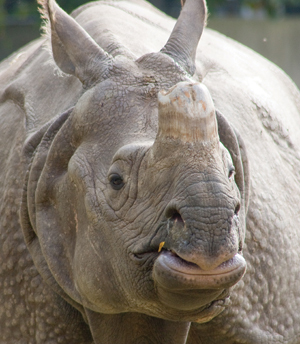 The word rhinoceros comes from the Greek rhino (nose) and ceros (horn). 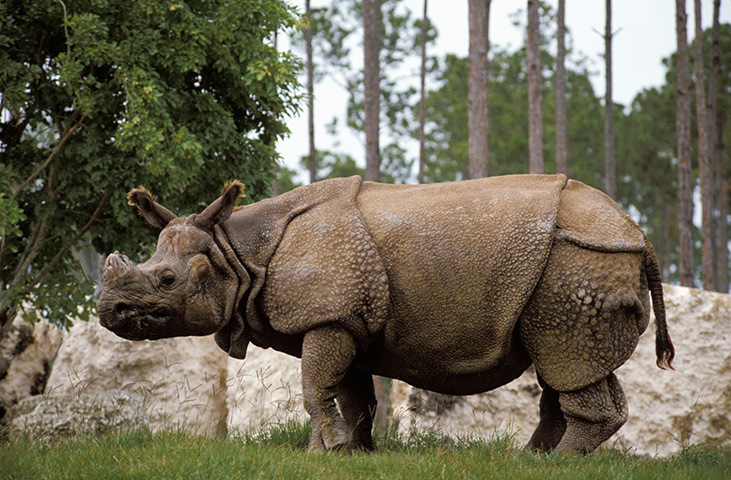 Depending on the species, rhinos can live to be 35 – 50 years old. Rhino horns are made of keratin, the same material that makes up your hair and fingernails. The closest living rhino “relatives” are tapirs, horses and zebras.